Dirty Projectors has always been about Dave Longstreth's complicated relationship between pop and experimentalism. Though the early sketches of what the vehicle would become began at the turn of the millennium while Longstreth was a student at Yale, Dirty Projectors truly emerged in 2005 with The Getty Address. Longstreth called the album a "glitch opera" about Don Henley of the Eagles. The record boomed with over 25 musicians and would stake a foothold for Longstreth's near-inscrutable lens on the construction of popular cultural and musical composition. If the concept behind that album raised a few eyebrows, a follow-up LP that reimagined from memory Black Flag's Rise Above dropped jaws like anvils. The freeform bursts of chiming guitar and maze-like vocal runs the band (featuring vocalists Amber Coffman and Angel Deradoorian) had tried out on Rise Above struck gold in 2009 with the release of Bitte Orca. Its lead single, "Stillness is the Move," was the cathartic meeting point of R&B-indebted vocals and indie rock's off-kilter equilibrium that spread like a breath of fresh air into many contemporaries' styles. The Projectors were rewarded with worldwide critical acclaim and invitations to collaborate from Bjork and David Byrne. A more lowkey affair surfaced with 2012's Swing Lo Magellan, perhaps foreshadowing that yet another Dirty Projectors reinvention was in its infancy. It's impossible to talk about the sprawling digital tapestry of naked emotion that is Dirty Projectors (2017) without an aside to mention Longstreth's romantic and artistic split from Coffman. It colours nearly every corner of the record, with Longstreth's abstract walls of words replaced by lyrics as agonizing as an exposed nerve. Stylistically, it embraced electronic music more than ever before. 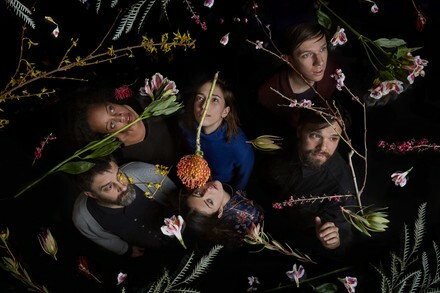 Just over a year later, Longstreth has put together a new six-piece version of Dirty Projectors to record and tour the forthcoming Lamp Lit Prose (out July 13 on Domino). Lead single “Break-Thru” teases a melding of their irresistibly idiosyncratic guitar melodies with the layers of electronics found on last year’s self-titled. The band’s appearance at Sled Island comes as part of the group’s first tour in five years, offering on-stage debuts of the new album’s tracks.